The graph above, from Think Progress, shows very clearly how union membership rates and the middle-class share of national income have declined together. As they say, though, correlation is not causation. We can know that these two things happened in the same time period in a way that shows up as a startlingly similar line on a graph, but they might be entirely unrelated, or both attributable to some other unmapped cause. 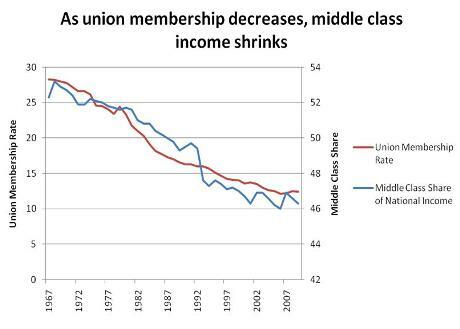 In this case, though, a new study bolsters the strong implication of that graph: Declining union membership is actually responsible for a significant part of the growth in income inequality. The (paywalled) study, by sociologists Bruce Western of Harvard and Jake Rosenfeld of the University of Washington, uses some terrifically frightening statistics to make this case. "Most researchers studying wage inequality have focused on the effects of educational stratification—pay differences based on level of education—and have generally under-emphasized the impact of unions." In other words, when Republicans and their corporate masters go after unions, they're not just coming for non-union workers next, they're already doing it. And when they tell you that unions are just looking out for their own members at your expense, they're saying something that contradicts the facts. Originally posted to Daily Kos Labor on Fri Aug 05, 2011 at 01:48 PM PDT.